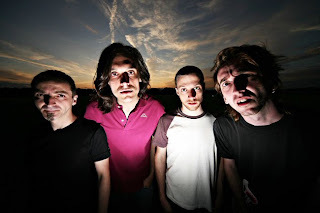 Los Angeles epic, heavy quintet Red Sparowes has announced North American headlining tour dates this spring supporting its forthcoming third album. The album, titled The Fear Is Excruciating, But Therein Lies The Answer will be released via Sargent House on April 6th, 2010. Red Sparowes will be accompanied on sections of the tour by Doomriders, Caspian and Fang Island. See complete tour dates and album track listing below. Thunderheads storming across the prairie, outraged students taking to the streets, migratory herds stampeding along the tundra--any number of images could describe the grandiose scope of Red Sparowes’ lush vignettes. Wielding both a master’s sense of nuance and an outsider artist’s unhindered expressionist zeal, the Los Angeles quintet created a catalog of haunting and hallucinatory guitar orchestrations over the course of the millennium’s opening decade. 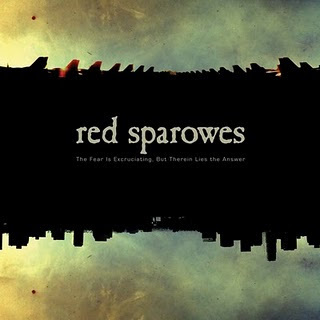 With two albums, a string of split releases, multiple U.S. and European tours, and a number of line-up changes under their belt, Red Sparowes are currently poised to release their third album and most impressive creation to date, The Fear is Excruciating, But Therein Lies the Answer. Though Red Sparowes’ music thrives unbound by narrative, the band provides a roadmap to their muse. Their 2005 debut album, At The Soundless Dawn, cast the scientific inevitability of the Sixth Extinction into a grand funeral oration, revealing the message within the individual track titles. Their second full-length, Every Red Heart Shines Toward the Red Sun (2006) provided a synopsis of the Great Sparrow campaign of the Great Leap Forward, laying bare its conceptual role. The Aphorisms EP (2008 digital, 2009 12" vinyl) served a thematic precursor to the next album. The immensely chaotic and fierce power-duo of drummer Zach Hill (Hella, Marnie Stern, et al.) and Nick Reinhart (Tera Melos) unleash their much-anticipated frenetic EP, Spiritual Bankruptcy today. The EP is released via Sargent House and is available for streaming and download HERE. 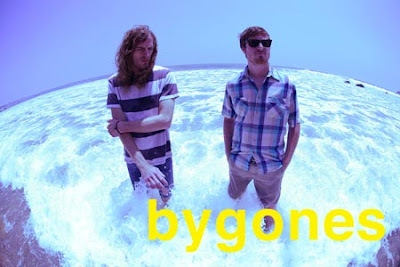 Watch videos of Bygones performing songs from the EP live in the studio HERE and HERE. 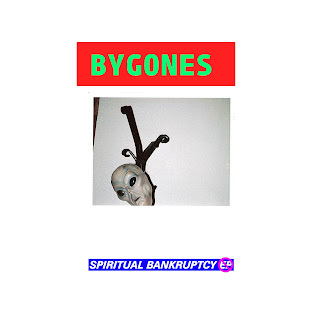 Bygones debut album by- was released August 4th, 2009 on CD, vinyl and digital download via Sargent House. 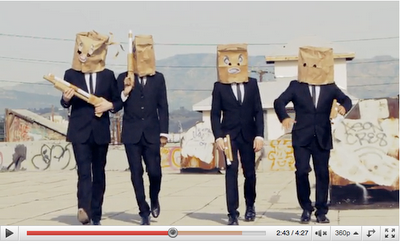 Amid a wealth of praise overseas, the mysterious Italian quartet N.A.M.B. has unleashed a stupendous animated music video for the song "Radiorace" off its new album, BMAN released stateside tomorrow. The album will be issued via UK label Monotreme Records (65Daysofstatic, Thee More Shallows) in a deluxe package with a 96-page full-color booklet illustrating an epic tale of an otherworldly robot and his quest for self-identity. 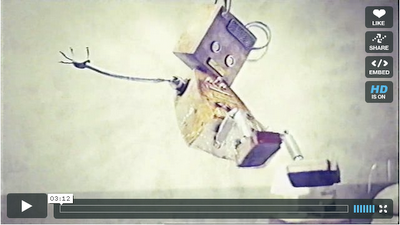 The video, described as "Wall-E meets The Wall" depicts the album's robotic protagonist BMAN being pursued by a horde of monstrous circuitry. Watch "Radiorace" HERE. N.A.M.B. 's heavy-leaning, electronic psychedelic sound elicits comparisons to the Flaming Lips, Muse, Girls Against Boys, et al. Check out the MP3 for "L.O.N." (HERE). Stream the album HERE. One thing we do know for certain: their second album, BMAN, is a magnificent sonic adventure, with a psychedelic flair reminiscent of The Flaming Lips, dynamics and industrial elements á la Nine Inch Nails, massive stadium-friendly tunes and, beating underneath it all, a big heart of soulful pop. N.A.M.B.’s self-titled debut album Mescal was released in 2005 in Italy. 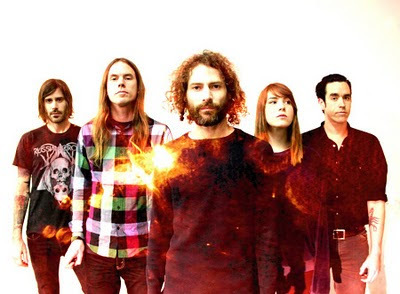 The album was mostly sung in Italian, and won the band a good following in Italy, where they shared stages with international touring bands including Fantomas, Blonde Redhead, Michael Franti, Spoon and Chikinki. In November 2006, work began on their sophomore album, BMAN -- an ambitious, multi-layered odyssey about a little robot called BMAN. For this album, the lyrics were written mostly in English. The album was produced by N.A.M.B in their own Superbudda studio, and mastered in London, UK by Bunt Stafford Clark (Thom Yorke, Graham Coxon, Elbow, Placebo, Jesus and Mary Chain). Accompanying the CD album is a 96-page booklet of original drawings by Maq4ka, illustrating the story of BMAN, with additional drawings by Gabriele Ottino. Southern California's multifaceted prog-psych-rock quartet RX Bandits has unveiled plans to perform three previous albums (The Resignation, And The Battle Begun and Mandala) in their entirety in three successive shows in New York City on March 25th, 26th and 27th during the band's upcoming spring tour. The group will also perform at this year's Coachella music festival on Saturday, April 17th. Additionally, RX Bandits have released a new video (watch HERE) for the song "Hope Is A Butterfly, No Net Its Captor" off their latest album, Mandala. RX Bandits once again take to the road this month, first in Australia as the group joins the massive multi-city traveling Soundwave Festival alongside Faith No More, Jane's Addiction, Sunny Day Real Estate and more. Then, headlining US dates follow in March with The Builders and the Butchers and Zechs Marquise supporting. Please see below for complete dates. Watch the official tour promo video HERE. RX Bandits recently performed a special acoustic set on BBC Radio 1's "The Punk Show with Mike Davies" and appeared on Fuel TV's "The Daily Habit". Click here to watch videos. Mandala: few titles are as perfectly befitting an album for a band reaching the culmination of a decade-long musical transformation. With this recording, RX Bandits have truly struck the essence of their merging of genres into a complete and masterfully detailed mosaic. Check out the MP3 for the single, "My Lonesome Only Friend" HERE. Stream the entire album HERE. Tracking for Mandala took place at The Mouse House Studio in Northern Pasadena in March of 2009, and marked the return of producer Chris Fudurich to the fold.The album features dramatically hypnotic artwork by Sonny Kay. Mandala was released July 21st, 2009 via Sargent House. RX Bandits are available for interviews.